Physicists at the National Institute of Standards and Technology have overcome a hurdle in quantum computer development, having devised a viable way to manipulate a single "bit" in a quantum processor without disturbing the information stored in its neighbors. The approach, which makes novel use of polarized light to create "effective" magnetic fields, could bring the long-sought computers a step closer to reality. A great challenge in creating a working quantum computer is maintaining control over the carriers of information, the "switches" in a quantum processor while isolating them from the environment. These quantum bits, or "qubits," have the uncanny ability to exist in both "on" and "off" positions simultaneously, giving quantum computers the power to solve problems conventional computers find intractable - such as breaking complex cryptographic codes. One approach to quantum computer development aims to use a single isolated rubidium atom as a qubit. Each such rubidium atom can take on any of eight different energy states, so the design goal is to choose two of these energy states to represent the on and off positions. Ideally, these two states should be completely insensitive to stray magnetic fields that can destroy the qubit's ability to be simultaneously on and off, ruining calculations. However, choosing such "field-insensitive" states also makes the qubits less sensitive to those magnetic fields used intentionally to select and manipulate them. "It's a bit of a catch-22," says NIST's Nathan Lundblad. "The more sensitive to individual control you make the qubits, the more difficult it becomes to make them work properly." To solve the problem of using magnetic fields to control the individual atoms while keeping stray fields at bay, the NIST team used two pairs of energy states within the same atom. Each pair is best suited to a different task: One pair is used as a "memory" qubit for storing information, while the second "working" pair comprises a qubit to be used for computation. While each pair of states is field- insensitive, transitions between the memory and working states are sensitive, and amenable to field control. When a memory qubit needs to perform a computation, a magnetic field can make it change hats. And it can do this without disturbing nearby memory qubits. The NIST team demonstrated this approach in an array of atoms grouped into pairs, using the technique to address one member of each pair individually. Grouping the atoms into pairs, Lundblad says, allows the team to simplify the problem from selecting one qubit out of many to selecting one out of two - which, as they show in their paper, can be done by creating an effective magnetic field, not with electric current as is ordinarily done, but with a beam of polarized light. The polarized-light technique, which the NIST team developed, can be extended to select specific qubits out of a large group, making it useful for addressing individual qubits in a quantum processor without affecting those nearby. "If a working quantum computer is ever to be built," Lundblad says, "these problems need to be addressed, and we think we've made a good case for how to do it." But, he adds, the long-term challenge to quantum computing remains: integrating all of the required ingredients into a single apparatus with many qubits. More information: N. Lundblad, J.M. Obrecht, I.B. Spielman, and J.V. Porto. Field-sensitive addressing and control of field-insensitive neutral-atom qubits. Nature Physics, July 5, 2009. A Quantum CPU: the Pentium Q? Even with current technologies topping my bank account is technically a very easy to solve problem. If the quantum computer will solve this I will take it. Otherwise it is useless to me. 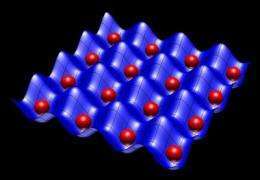 Quantum computing is pure crackpottery, on a par with the flat earth hypothesis. Don't let physicists pull a wool over your eyes and treat you like an idiot. Woah! Hold on a Planck second. Doesn't this mean that all the previous announcements to the effect that researchers have already built working quantum computers with various numbers of qbits, were a bunch of BS? Yep. That's exactly what they were, BS. I smell crackpottery and fraud every time quantum computing is mentioned. NIST should be ashamed of themselves, for the way they spend the taxpayer's money on silly crackpottery. Where is the congressional oversight on this nonsense? Isn't it about time that this so-called science that never shows anything solid (it's always around the corner and in need of more funding) gets fingered for what it is? Where are the critics of QC? Are they all scared by the peer review system? I think so.